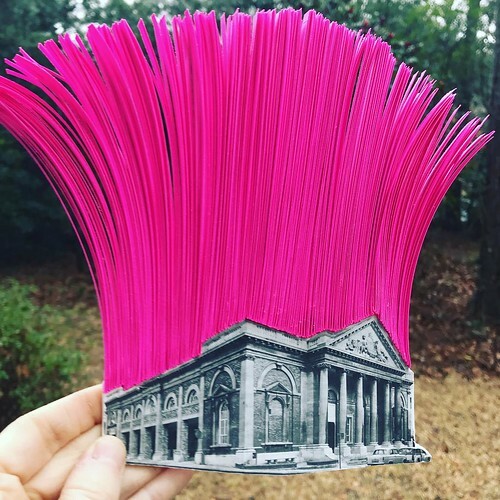 Every now and then I come across someone who is doing something totally new and exciting with paper quilling (an art form that has been enjoying an abundance of change in recent years), and Griffin Carrick is one such person. 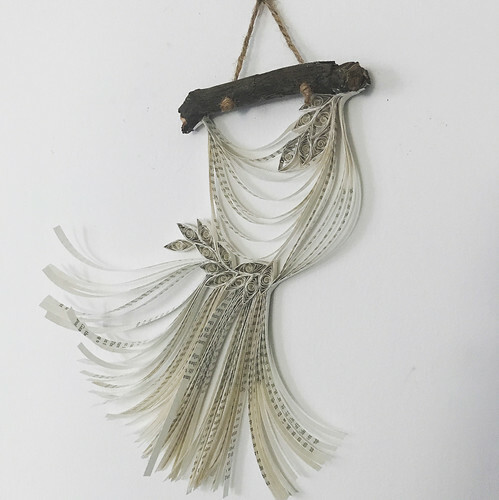 The overall appearance of her work references 70's fringed macrame that's oh so popular again, yet Griffin's sculptures are composed of traditionally quilled components rather than textural weaving. Industrial elements such as wood, copper, and rope lend visual strength. 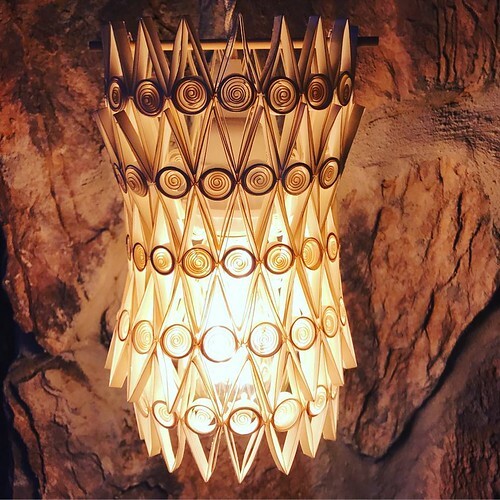 With an Architecture degree and a Master of Arts in Interior Design, it isn't surprising that she is taking quilling in an innovative direction. Her sculptures have caught the eye of Grace Bonney at Design Sponge who declared them amazing. 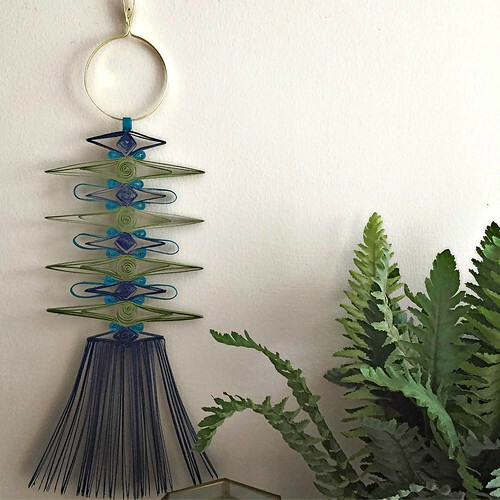 In addition to wall hangings, Griffin creates mobiles, light fixtures, jewelry, and collages with retro-modern flair. I invited Griffin to tell us about about her start in paper art. I started quilling just over a year and a half ago. I was looking for a creative outlet that didn't require the use of my computer. I work from home teaching interior design courses and designing residential interiors, so most of my creative energy is geared toward this work and it is all online. I wanted a creative hobby that I could dive right into and start making... something that I didn’t have to spend a ton of time learning new skills and techniques or invest in a bunch of new equipment. I remembered a vase of flowers I had made back in the fourth grade that was composed of rolled pieces of construction paper. I was really proud of it at the time and thought that maybe this rolling paper thing was something I could try as an adult - I had plenty of paper and glue on hand, thanks to my daughter's craft supplies, so I just started playing around with it. 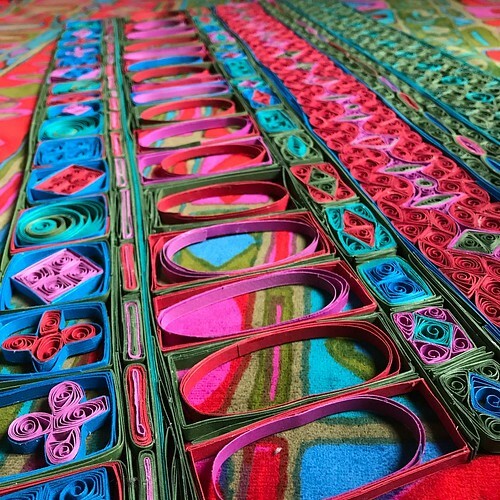 There was a moment when I first started where I thought maybe I invented this technique of folding and rolling paper; I had no idea at the time that it was called quilling. Of course an internet search introduced me to artists and makers doing really fun things with paper! 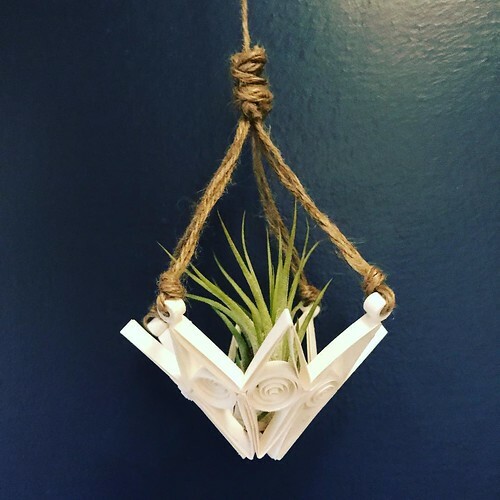 What led you down this path of creating quilling that melds with macrame? After I figured out that what I was doing was quilling (and I did NOT invent it! ), I realized pretty quickly that I was not particularly skilled or interested in making more figurative work. I was really into macrame and woven wall hangings at the time and wondered if I could somehow translate what I loved about these textile arts into paper. Instead of gluing the quilled paper to a backing, I started gluing the coils to each other. 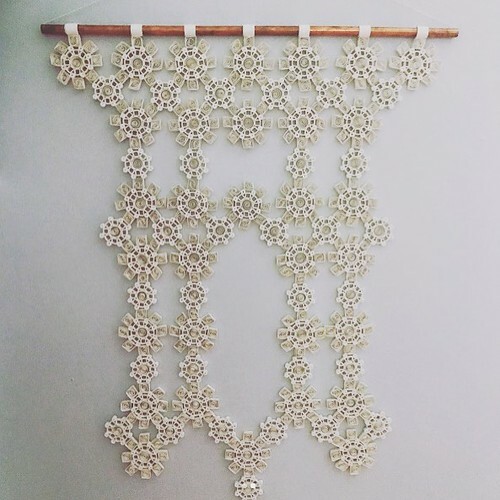 This allowed me to play with pattern and texture, which was what I loved about macrame and weaving, as well as other textile arts like lacework and quilting. 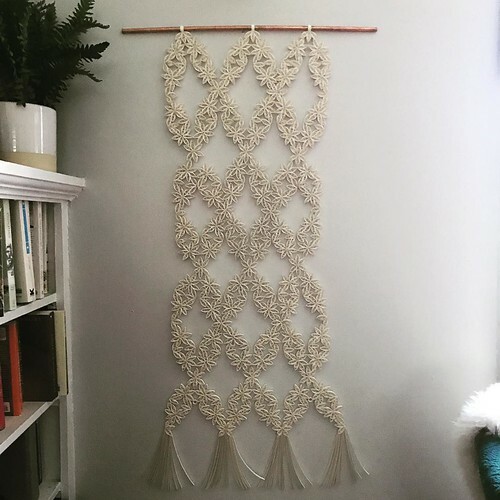 I used mostly white paper for the first year and since many of my pieces had a similar feel to macrame, I often refer to my work as paper macrame. 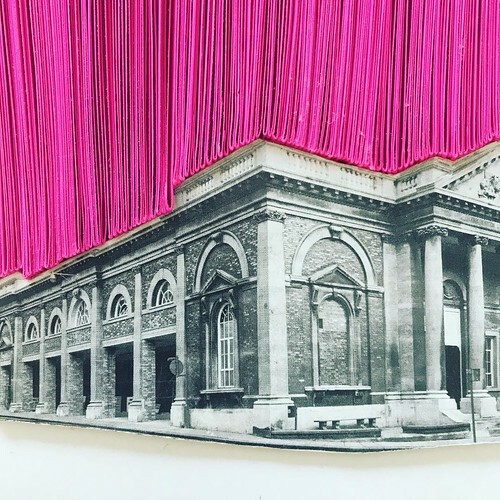 While the textile arts have been my main source of inspiration, I am also always looking at patterns, textures, and forms found in architecture and nature to inspire my work. What are your future quilling plans? Until recently I mostly worked with white paper; for some reason I was intimidated by color. I’m slowly getting over that and experimenting with more color in my work. Moving ahead, I want to make bigger wall hangings/sculptures. I just need to find the patience to stick with it and a place to put the work! 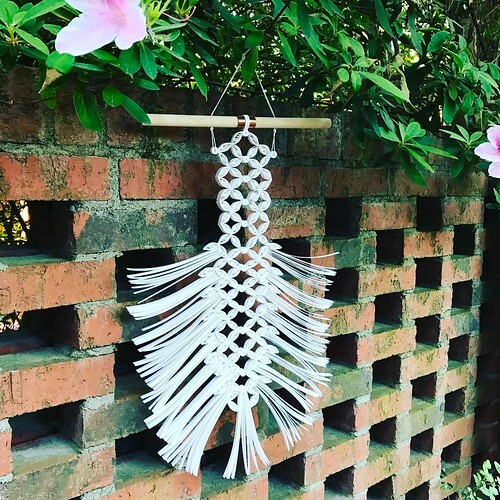 I’ve had the opportunity to enter my pieces in local art shows here in Fayetteville, North Carolina, which is really fun, particularly because quilling is not a technique we are used to seeing as fine art. I hope to enter my work in more art and craft shows. Ultimately, I’m having fun experimenting with quilling! I've found I don’t get bored with it. 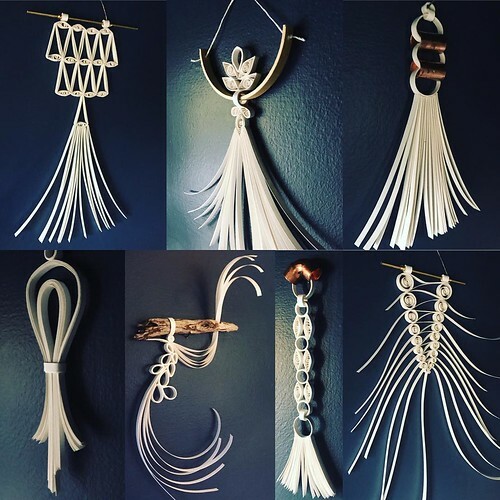 When I run out of ideas for my paper macrame wall hangings, I’ll make a mobile or light fixture or I’ll experiment with making jewelry, and when I’m bored of that I move onto quilled collage... and that usually leads me back to wall hangings. 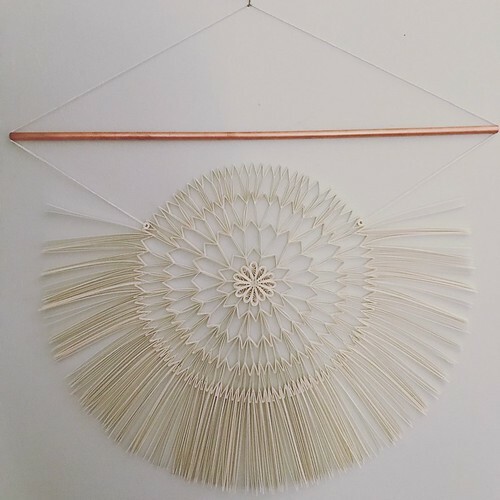 Have you worked with traditional quilling supplies? I use card stock, since it is stiffer than paper and better for more sculptural designs. 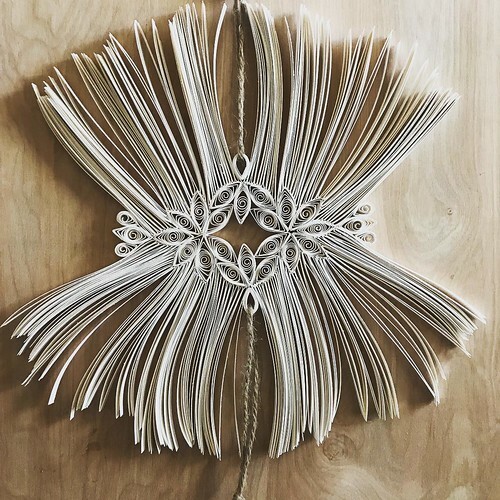 I use 100% PCW recycled card stock for my white pieces as well as thrifted book pages for some of my sculptures, jewelry, and quilled collages. I'm still on the hunt for recycled colored card stock, if anyone has a source. I cut all my own paper using a paper trimmer, and I actually just upgraded the type of trimmer I use as I found I wasn’t using one designed for the thickness of my card stock. What a difference using the proper tools makes! I use a simple $2 quilling tool for all of my quilling and I’ll use whatever I have around if I want to roll a coil that's a larger size. As for glue, I use Sobo. I used it in architecture school to build models and found it has a pretty strong hold and dries quickly. Quilling is great because it’s portable and materials are affordable. I love the idea of taking something as simple as paper, which is usually just a backdrop for beautiful images and text and making it the focal point! 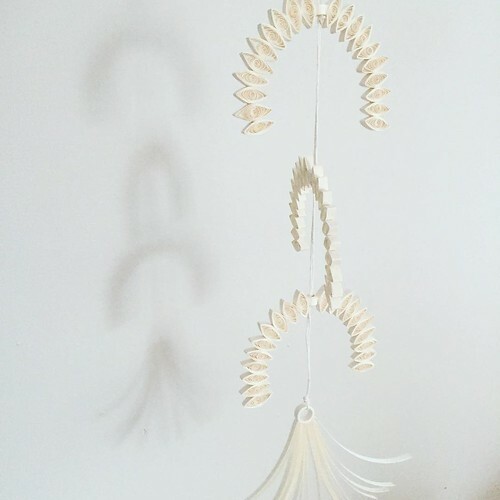 My website, Griffin Carrick Design, houses my experimentations in paper quilling. My paper wall hangings are for sale in my Etsy shop, Griffin Carrick Design, and I'm active on Instagram and Pinterest. I'm a big fan of Griffins work. Her style is always refreshing and opens my eyes as to what's possible with paper! I can spot her work from a mile away because its so unique. Talk about making the old new again! 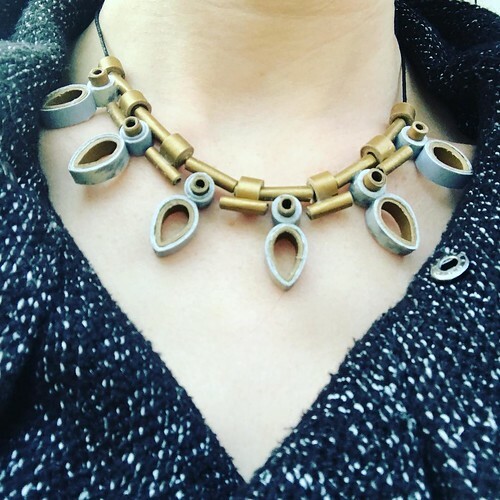 Wonderful pieces. This is absolument GREAT and so beautiful. Love that macrame like art. Thank you for showing us the wonderful work of Griffin Carrick. So glad you all enjoyed seeing this post and thanks for your comments! These are absolutely outstanding! such talent...I wish I could make such gorgeous pieces.